This single-bladed battle axe is a fun axe hold. Hand-crafted and made of Stainless steel, the axe features a 7 inch rounded cutting edge and sharpened spike. The handle is of Brown hardwood with studded inlays. 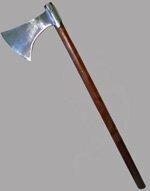 The axe makes a fierce looking display, particularly with two axes and possibly a shield. Also a brilliant accessory to any warrior garb. It would be devastating and dangerous to spar with, so please do not use for such purposes. 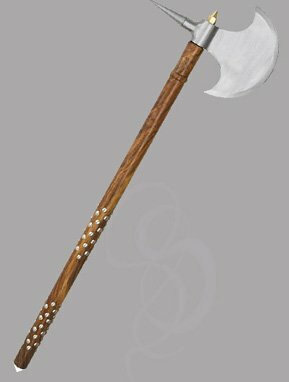 The Battle Axe is attle Axe - 32" overall. 10 1/8 inch axe head with 7 inch cutting edge.